I'm not a huge fan of Lawrence Felinghetti's poems but I've always admired and enjoyed the early figure he cut. The poetry, especially later, is schticky. Well, if you're going to do irreverent liberationist schtick, why not turn the glance at baseball and modernism at once. 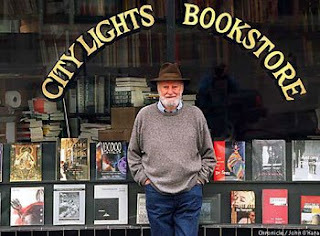 In "Baseball Canto" Ferlinghetti runs through a crude analogy between the racial and class undersides of baseball and the kind of poetry and poetics that might stand against the exclusivist epic-oriented modernism inherited from Ezra Pound. The analogy only works in a superficial political sense: Tito Fuentes and Willie Mays, beloved by the grungy populace in San Francisco's bleachers, surely hate usury. Poundian modernism becomes an imperialism. It's fast and, as I say, very rough. But funny and fun.